As we all know how awesome is Terraria. There are lots of things going on in this game. Today in this article you will get the information about Terraria Wings. How to get the wings and their ability. This Terraria wings guide will help you to know more about it. You can craft the angel wings with 10 Feathers, 25 Souls of Light, 20 Souls of Flight at a mythril or orichalcum anvil to grab. Its flight height is 104 ft and the horizontal speed is 6.25. To grab the demon wings is a crafted item. You just need 10 Feathers, 25 Souls of Night, 20 Souls of Flight, so all night these cells can be acquired in either underground hello or crimson/corruption depending on the world. Demon wings are similar to angel wings when it comes to flight height and horizontal speed. The Fin wings our quest reward from angler. To obtain angular removers find them at either side of the oceans and have a move into a house. Its flight height is 104 ft. There he do the elevation quests which you can complete rewards. The chance of getting the thin wings increase of your money Equestria completed the more quest die or chance. Fin wings are hard-mode only. Jetpack is a bible icon from the steam punker will move into your house once you defeated a mechanical boss. The jetpack is only sold on a vaccine moon which is between a new moon to a full moon and cost for the gold. Jetpack’s horizontal speed is 6.50 and flight height is 121. It emits orange light and give unique sound effects when used. For the Bee Wings you need to acquire at a table a way which is dropped by the mole solids in the underground jungle combine it with 1 Tattered Bee Wing, 20 Souls of Flight to create the wings. Bee wing goes up to 135 ft and 6.75 horizontal speed. To make the butterfly wings you need to find of rare month in the underground jungle and acquires butterflies from it. Then simply combine 20 Souls of Flight with a 1 Butterfly Dust. This wing’s speed and height is same as Bee wings. It emits pink light. If you want to cosplay as tinker bell or take revenge on RV then this is the item for you to make difference. You simply need to obtain 100 Pixie Dust, 20 Souls of Flight craft on a tan. It emits yellow light. Fairy wings have horizontal speed and flight height 6.75, 135 ft respectively. If you want to honor circuits will leave with style fight as the dark night, then you get a hold of the bat wings. To create the bat wings simply you need to kill vampires in during a solar eclipse and get the hold of one of their precious bat wings. Then you combine it with 20 Souls of Flight. Bat wings can fly up to 144 ft.
Harpy wings are created with a giant heart feather which connect aim for killing harpies then combine the giant heart feather 20 solo flight. Once again the giant harpy feather is the only winged material item which can obtain before hard-mode. So if you want to be early out for hard-mode then this is the wings for you. Its flight height is 144 ft and the horizontal speed is 7.00. Once in the hard-mode, you can get a hold of a bone feather when you are in the hard mode dungeon by killing our bones of any kind it is simply combined it with 1 Bone Feather, 20 Souls of Flight. Bone wings speed and flight is same as Harpy wings. Mothron Wings are a rare drop on the Mothron mini-boss during a solar eclipse. It Emits yellow light and glows in the dark. The leaf wings are purchasable from Witch Doctor. When you defeated the queen bee if you make a house frame in the hard mode jungle he will be available sailor the leaf wings at night for one platinum coin. Leaf Wings flight height is 162 ft and the horizontal speed is 6.75. This wing you can create with an ice feather which is a rare drop from the ice column. Which only spawns snow biomes during a snowstorm. A snowstorm is the equivalent of rain into the volumes once they acquire the feather. You simply combine with 1 Ice Feather, 20 Souls of Flight. Its flight height is same as Leaf wings and speed is 7.50. It glows in the dark. The very salty flame wings across table with a fire feather, which is a rare drop from the red devils in the underworld. Combine it with 1 Fire Feather, 20 Souls of Flight. It glows in the dark and particle effect emits orange light. Its speed and flight height is same as frozen wings. To obtain specter wings you will need a total of 60 glorified or which can only mine in an urban jungle. Melt them hydrant adamantium or titanium forge then you need to get 10 Ectoplasm. Which can get from killing skeletons in a dungeon with 20 Souls of Flight. Its speed and flight height is same as flame wings. To create the Beetle Wings you need a total of 8 Beetle husks, which is dropped by the Golem in the list of temple. You spawn the Golem with power cells which can either obtain from mobs or chests within the temple. Once you got hold on beetle husks combine them with 20 Souls of flight. Beetle Wings are completely silent and its speed and flight height is same as flame wings. Once again when you get a hold of this item you did not need roads anymore. To craft the Hoverboard you will need a total of 108 corridor, 370 glowing Mushrooms and an ultra hammer which can bargain truffle. Then combine it all together once you have gotten hold over 18 Shroomite bars, 20 Souls of flight. They got yourself a Hoverboard. It will increase your speed by 200% and it’s completely silent. The festive wings are rare drop from the Everscreams during the Forstmann event. Its flight height is 172 ft and speed is 7.50. Festive wings glows in the dark. To craft Tattered Fairy wings all you need 1 Black Fairy Dust and 20 Souls of flight. It’s particle effect emits yellow light. Tattered Fairy wings flight height is 182 ft and speed is 7.50. 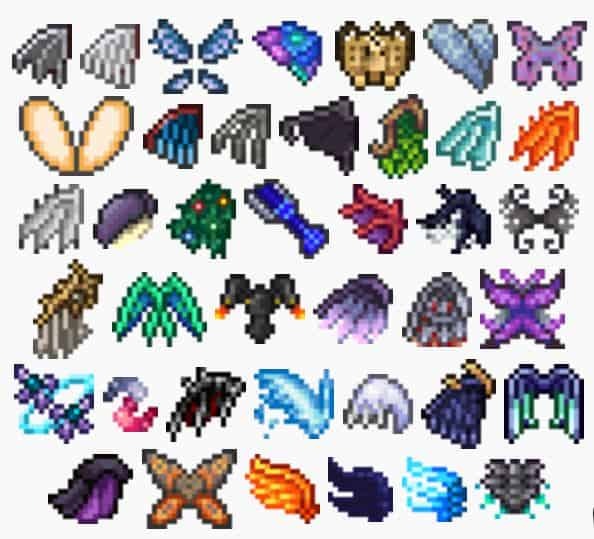 To obtain spooky wings in Terraria you need 1 Spooky Twig, 20 Souls of Flight. spooky wings speed and flight height is same as Tattered Fairy wings. Once again you can now buy the steampunk wings from the steampunker for 1 platinum coin, once you defeated the Golem. First of all the fish from wings are better than the Vortex booster and the Starters wings. Spooky wings flight height is 182 ft and speed is 7.75 and its not available for mobile version yet. You will need to activate the lunar event to start the lunar event you willl need to defeat the lunatic kills this boss at the dungeon. This will trigger an event all over world which spawns four towers. You need to destroy you will also get an image manipulate from the lunatic cultists. You need to take care on for later on to destroy the towers. You need to kill 100 enemies on normal difficulty and 150 on expert, then you are able to destroy the towers. Each of the towers drop a different type of fragments once all the four towers are destroyed. The moon or boss will spawn once the moon lord is defeated. He will drop a doom night or which you can turn into lunette bars at the ancient manipulator. Which you obtained earlier to cross the wings. You need 10 Luminite bars per set of wings and 14 of that type of fragmental wings. You want to create and you create the wings at the ancient manipulator. The vortex fragments gives you the vortex booster and the stardust fragments give you the stardust wings. The vortex booster and the starters wings and the ability to glide horizontally like the Hoverboard or cooling down space. You get a nebula mantle or nebula wings with the solar fragments. You can now create the best wings in the game. Spooky wings flight height is 212 ft and speed is 12.00. It emits blue light and glow in dark. Nebula Mantle help to accelerate and it glows in dark. Nebula Mantle can goes up to 330 ft. Solar Wings glows in the dark and emits orange light. Its flying ability is 334 ft and horizontal speed is 9.00. We hope this Terraria Wings guide will help you. If you have any question then leave a comment. Keep visiting this page as we are updating this page regularly to add more awesome content.